Chad Barber survived an engine failure during an aerobatics routine in a Pitts Special and it’s all on video. Chad had just completed a negative G maneuver followed by a four-point roll then a pitch up to vertical. At this point 22 seconds into the video, the engine hiccups and quits. Trading altitude (2,500′) for airspeed, Chad dives in an attempt to aerodynamically re-start the engine. The blades turn a few times, but doesn’t restart the engine. Twenty-one seconds after the engine quit, Chad is at 1,000’ and turning toward a gravel road. While setting himself up to land, he then uses the electric starter, which finally starts the engine. Like many aerobatic planes, the Pitts has an inverted fuel system. Chad’s Pitts has a 19 gallon fuel tank that feeds fuel into a flexible hose with a weight on the end called a flop tube. Gravity being a constant, both the fuel in the tank and the flop tube will always seek the “bottom” of the tank. Flop tube as seen inside Pete Miller‘s RV-7 fuel tank project. Chad makes a habit of never flying aerobatics with less than 6 gallons of fuel, including this flight. In this situation, an extended negative G maneuver caused the flop tube to lose contact with the fuel, which starved the engine of fuel. Over time, the flop tube in Chad’s Pitts lost some flexibility, which made it harder to reach the available fuel as the fuel level decreased. The flop tube has since been replaced. 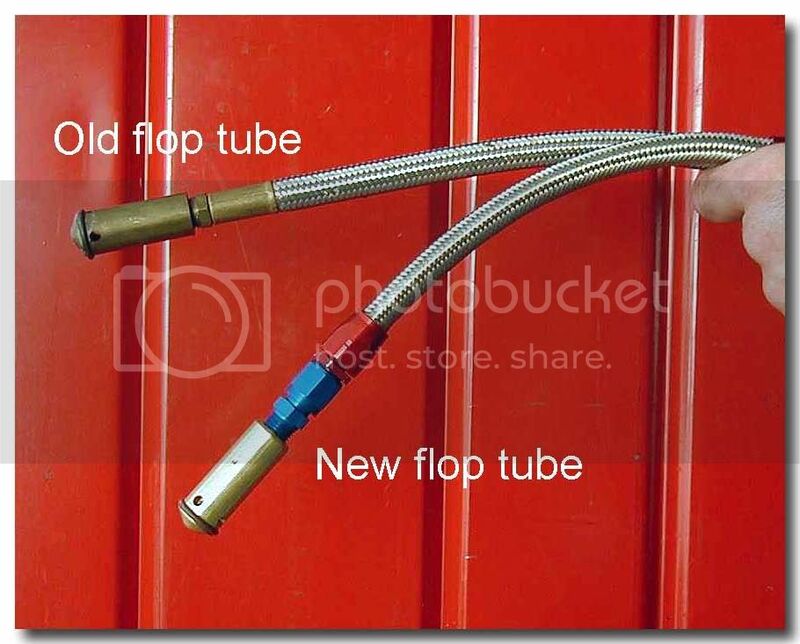 Old v. new shows decreased flop tube flexibility courtesy Biplane Forums. Chad has also increased his personal fuel minimum for negative G maneuvers to no less than 10 gallons in the tank. Chad Barber has been an active pilot for six years and resides in Palm Beach, Fla. As owner of Barber Aviation, Chad provides aircraft delivery, aerobatic training, aerial photography, and aviation management services. Despite some of the above comments, nice job! You kept your head, flew the plane, worked the problem, and in the end you were successful in restarting the engine and returned to home base with neither you nor your aircraft damaged. Had it not restarted you were already lined up for what appeared to be an uneventful off airport landing. It just doesn’t get better than that … well done! His battery/starter is weakass, maybe he ought to replace that as well, instead of loading up with more fuel. If my car runs out of gas, and I put more gas in it, and the starter on my car is barely able to turn over the engine to restart it, I’m not going to just “fix it” by filling up the gas tank more next time. Wondering why or how the “flop tube” looses flexibility over time since its constantly being lubricated by the fuel but it is what it is. Not sure why you assume avgas would be a preservative. Gas causes hardening in many hose materials over time. It is a reaction from the components in the fuel to the material inside the tube. A well know problem with floor tubes made from older type materials. Headline is a bit OTT I think.